Growing up, we were (I’m assuming) all taught the three magic words—“Please” and “Thank You.” I remember my parents even asking me “What do you say?” when teaching me when to use these words. However, with the invention of technology, we have sometimes forgotten to use our manners, especially when searching on Google. While most of us just type in key words or phrases for what we are looking for, there is one granny who is keeping her P’s & Q’s. Meet Ben John’s grandma. When looking through her recent Google search history, he noticed she added “Please” and “Thank You” to her request to convert Roman numerals. 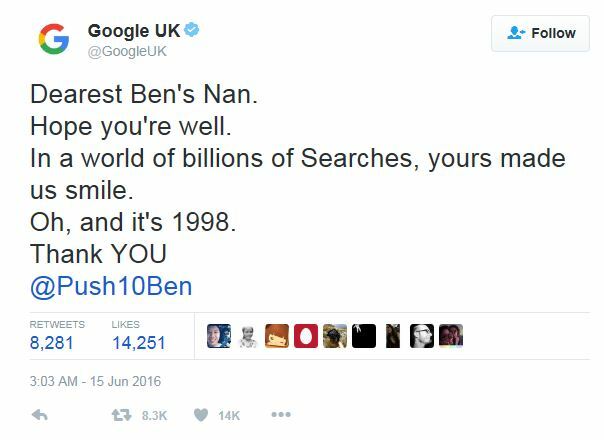 Needing to share this aww moment with the world, he tweeted a photo of this Google query and immediately received 12,000 immediate “likes” and thousands expressed their love for Ben’s Nan… even Google! Remember kids, using your manners never gets old.